In Pursuit of my Inner Pin-up: What's Wrong with this Picture? When I recently found this full-page advertisement in a magazine, I just had to tear it out and share with you all to see if you have the same reaction as I did. Per Serving: 687 Calories; 32g Fat (41.6% calories from fat); 27g Protein; 73g Carbohydrate; 3g Dietary Fiber; 60mg Cholesterol; 718mg Sodium. Exchanges: 4 1/2 http://www.blogger.com/img/blank.gifGrain(Starch); 1/2 Vegetable; 1 1/2 Fat. And, as if that weren’t bad enough, the manufacturer is encouraging us to have seconds! More specifically, to feed our children a double portion! Seriously? At a time when childhood obesity rates are skyrocketing, when the television is overrun with shows such as , when Jamie Oliver has to come from across the pond to save our kids, and our First Lady has taken up this issue as her own personal cause, is this really appropriate? Do we seriously want to equate love, especially parental love, with food? Isn’t that the attitude that’s gotten so many of us into this mess in the first place? Listen, I understand that this is an advertisement, meant to sell a product, and we’re not supposed to take it very seriously. But we know how powerful advertising is, and this full-page picture placed in a popular women’s magazine is surely quite effective. How many busy mothers took a look at this recipe, with the minimal amount of ingredients and relatively low-cost ($1.90 per serving accordinghttp://www.blogger.com/img/blank.gif to the website) and ran right out to the supermarket to purchase and prepare this dish in order to please her hungry children? Since the nutritional values are not included on the recipe, nor even on the website, she wouldn’t have known the huge calorie & fat count at first glance, and might not have had the time or tools to do the math as I did. Nor might she have had the extra money or time to make healthier substitutions (whole wheat pasta, fresh tomatoes, veggie or turkey sausage). 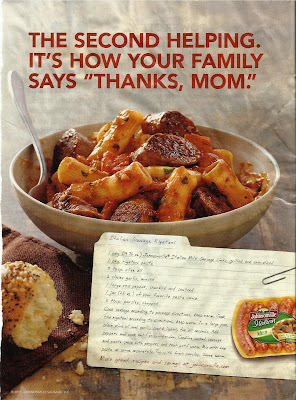 She’s just going to whip this up and put it on the table, maybe with a side salad and some (groan) frozen garlic bread. So, what’s the answer, dear readers? To the moms out there who are working full time both outside and inside your homes, how do you ensure that your family is eating healthfully with the limited amount of hours you have to shop & cook the meals? Please, share your thoughts and tips, I’d love to hear them! As a person that grew up in a home where french fries and gravy were a staple, I freak when I see this kind of stuff! We have to take control. We have to cook at home and be sensible about it. Research recipes, understand caloric requirement and eat real food. Its not difficult, but its truly a mindset. So I was wondering what you thought about this article. Municipalities have enacted ordinances requiring food establishments to put the caloric and nutritional values alongside the food items in fast food establishments. This study tracked how consumption was impacted and they found little change in peoples purchases even with confronted right at the point of sale with the health impact of their buying decision. I disagree with you about this advertisement and that “ we’re not supposed to take it very seriously.” Food manufactures are floating multi-million dollar ad campaigns to sway us and our wallets to prop up their products. Our age group probably doesn't take them seriously but our kids are inundated with advertising and young children can not always disseminate between realty and ad speak. Thanks for the calorie #'s. Jen, I totally agree with you, thank you for sharing the article.